When you are done working with a client on a particular job, you will want to end things with the job in the Completed job stage after completing all of your job’s tasks. A job/lead should only be closed when either a new lead does not end up booking with you, or when a booked job ends up canceling for any reason. 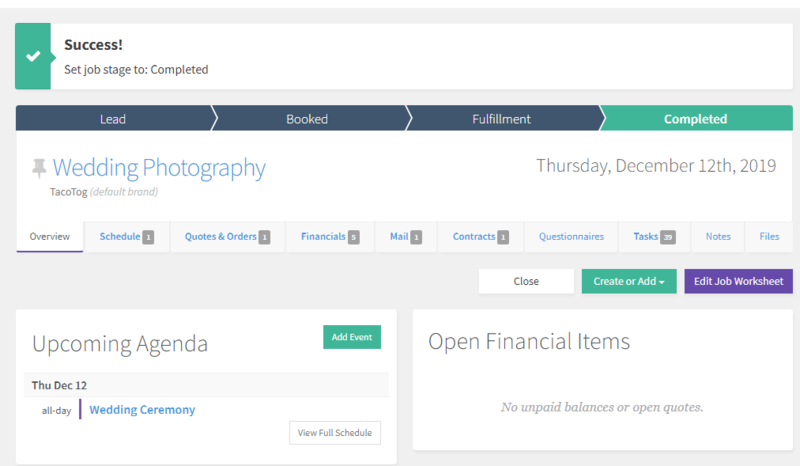 Once a job is closed, all upcoming events on the schedule will be canceled and any outstanding invoices on all orders placed will be voided. In the second case above, when a booked job ends up canceling before completion, it’s important to know that any payments you have already received prior to the cancellation will still be accounted for in your income reports. If you close jobs that were actually fulfilled through completion, it will result in inaccuracies in your reporting within Táve, affecting things like your job conversion rates in your booking reports or your lead closed reasons. 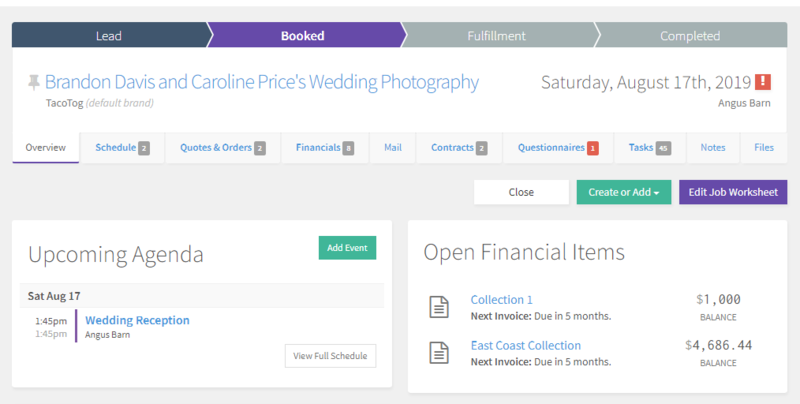 There are 2 ways a job can be marked as completed when you are done with all of the tasks associated with a booking: through an automatic prompt you may receive or by manually marking it as completed. When you are finished with the very last task in your job’s task list and you check it off as being done from within the job’s task tab, you’ll receive a prompt asking if you want to move the job to the completed stage. 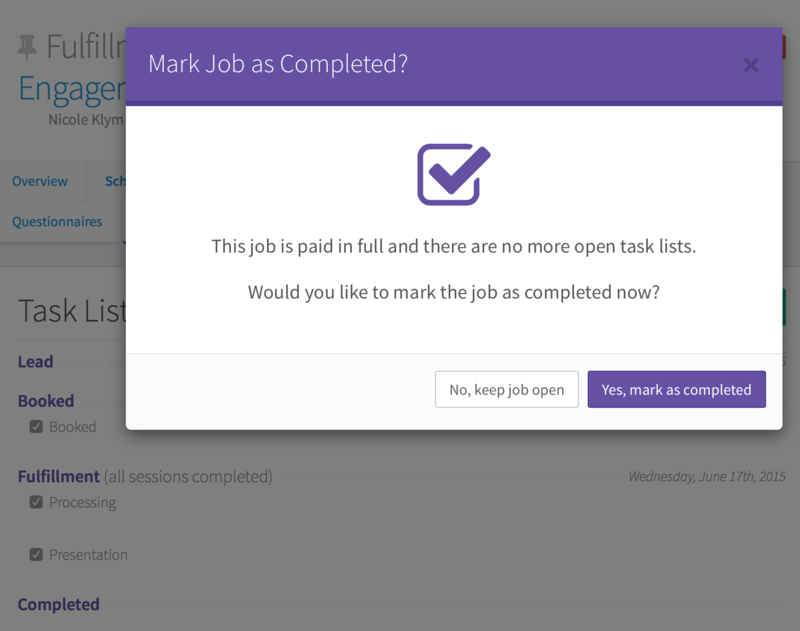 Alternatively, you can mark a job as being completed by simply clicking on the Completed stage in the status bar of the job while viewing it. 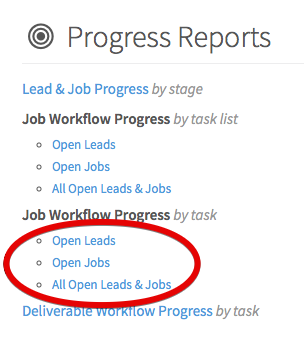 In the Job Workflow Progress by Task section of your Táve Reports, you’ll find 3 reports that show you your current outstanding job workflow tasks on all of your jobs, sorted by the workflow assigned. Here, you can click “complete job” on those jobs that have all tasks completed and are ready to be moved to the Completed stage. There are also 2 ways a lead or canceled job can be closed. You can do it manually, or have it done automatically under certain circumstances using a Táve automation. While viewing a lead or job from its overview page, you will notice a Close button on the right side of the screen that turns red when you hover over it. You can simply choose that option to close it out, where you will then be prompted to select a reason for its closure. 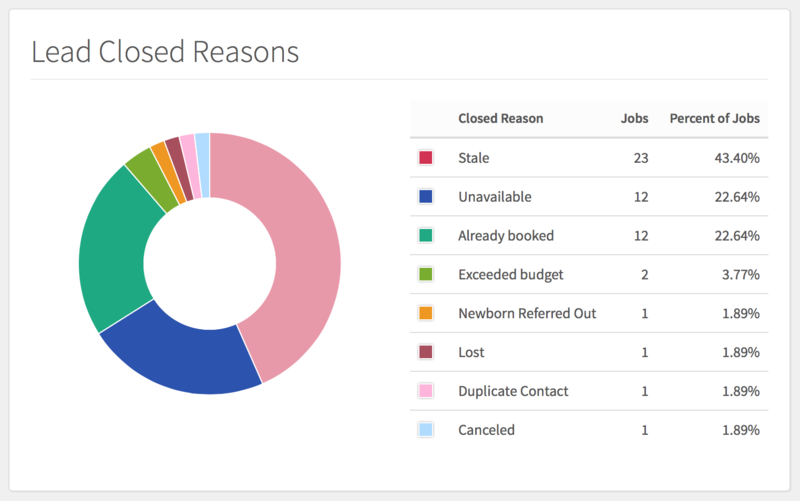 You can customize these closed reasons in your Job Closed Reasons area within your Táve Settings. 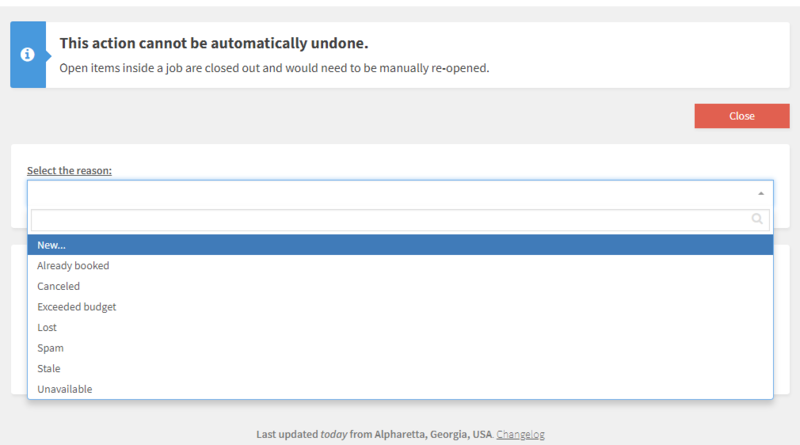 Upon manually marking a job as closed, you will notice a new Purge option on the screen where the Close button once was. You should choose to purge a lead or job only if you want to permanently delete all of the data associated with this lead/job. It is suggested that you only purge a closed lead/job if you were testing some settings in your account and created a fake job, or something along those lines. 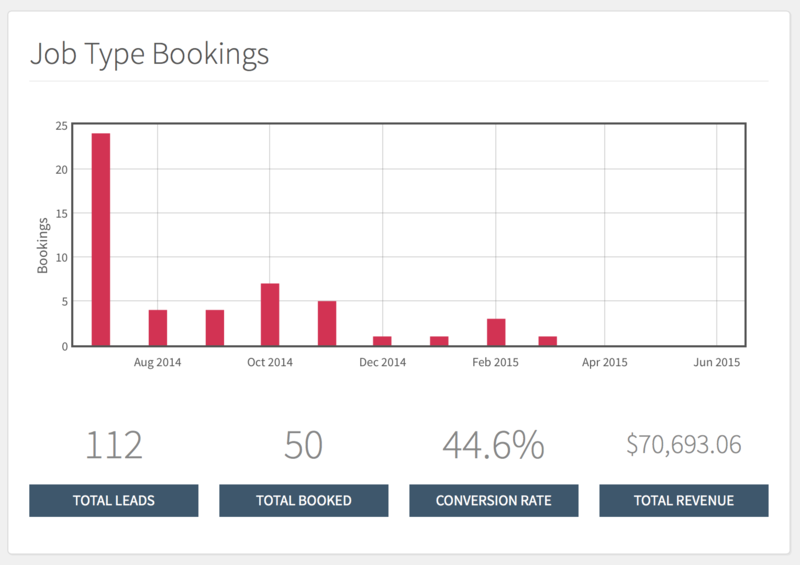 Much like a lot of things in Táve, you can automate a lead or job closing. This can be done by setting up a rule in your Stale lead status that automatically closes out the lead after it has been in the Stale lead status for a certain number of days, weeks or months. You can even tell it the closed reason you'd like it to use when closing it automatically this way.